Back in June, Neil Irwin wrote that he couldn’t find enough synonyms for “good” to adequately describe the jobs numbers. I have the opposite problem. I’ve tried every word I could come up with—including “lopsided,” “highly skewed,” and “grotesquely unequal“—to describe how “bad” this recovery has been, especially for workers. For the first time since the onset of the global financial crisis in 2008, there are more people with a job in the OECD area than before the crisis. Unemployment rates are below, or close to, pre-crisis levels in almost all countries. . . Yet, wage growth is still missing in action. . . Even more worrisome, this unprecedented wage stagnation is not evenly distributed across workers. Real labour incomes of the top 1% of income earners have increased much faster than those of median full-time workers in recent years, reinforcing a long-standing trend. This, in turn, is contributing to a growing dissatisfaction by many about the nature, if not the strength, of the recovery: while jobs are finally back, only some fortunate few at the top are also enjoying improvements in earnings and job quality. Workers’ wages have been stagnant for the past decade across the 36 countries that make up the Organisation for Economic Cooperation and Development. 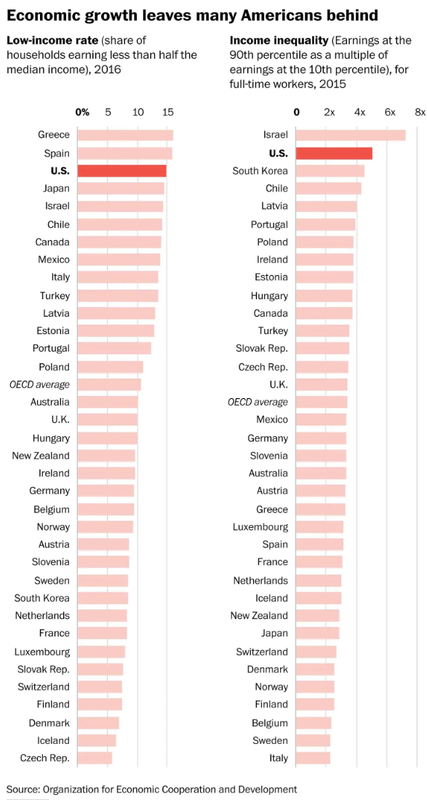 But the problem has been particularly acute in the United States, where the “low-income rate” is high (only surpassed by two countries, Greece and Spain) and “income inequality” even worse (following only Israel). The causes are clear: workers suffer when many of the new jobs they’re forced to have the freedom to take are on the low end of the wage scale, unemployed and at-risk workers are getting very little support from the government, and employed workers are impeded by a weak collective-bargaining system. That’s exactly what we’ve seen in the United State ever since the crisis broke out—which has continued during the entire recovery. But we also have to look at the opposite pole: the growth of corporate profits is both a condition and consequence of the stagnation of workers’ wages. Employers have been able to use those profits not to increase worker pay (except for CEOs and other corporate executives whose pay is actually a distribution of those profits), but to purchase new technologies and take advantage of national and global patterns of production and trade to keep both unemployed and employed workers in a precarious position. That precarity, even as employment has expanded, serves to keep wages low—and profits growing. What we’re seeing then, especially in the United States, is a self-reinforcing cycle of high profits, low wages, and even higher profits. *And, of course, even longer: from 114 in 1960 or 112 in 1970 or even 110.2 in 2001.